My family is considering a move to T-Mobile, which means an excuse to get new phones! I'd be coming from a Verizon Note 4. I've read that several V10 users here switched from the Note 4. I've also read that V10 battery life isn't the best, which has me a bit worried. I'd like to solicit some opinions and maybe some comparisons from you fine former ex-Note 4 users here. How does V10 battery life fare versus that of your Note 4? Any other things you'd like to mention? In an article (Comparison: Nexus 6P versus LG G4 and V10 | Android Central), Jerry mentions, "The Nexus 6P and G4 seem pretty equal when it comes to reception (voice and data on T-Mobile), and both seem slightly better than the V10." It doesn't sound like it's something I should be incredibly worried about, but I want my next phone to perform well as a phone, too. I imagine the V10 generally has better radios than the Note 4. Anybody have experience there? I'm also considering getting a Nexus 6p or an LG G4 (T-Mobile's $325 G4 deal sounds pretty sweet). I'd love to hear any experiences you all would be willing to share! Thanks! My battery life is actually pretty good on the V10. You will not regret this phone. LG G4 is good too. So far I've been pleased with the phone. I've had several androids and besides the nexus 6 the V10 is nice. Battery life varies on what I am doing during the day. I like LG's skin compared to Samsung TouchWiz skin. Wished all of them ran pure android. I've been using the Note 4 since it came out, Samsung fan since the Fascinate. I've had pretty much all of their phones and definitely all of the Notes up to the Note 5. Not going there due to no SD and non- removable battery. I bought the LG V10 to show my support and I really wanted a change. I upgrade often. Turns out it's a great phone! After switching back and forth for a week, I'm using it instead. The battery seems as good as my Note 4. I bought an OEM battery/charger dock on Amazon and I'm waiting on my promo battery/and card. I did the same thing. Moved the family from Verizon to t mobile. Way cheaper. 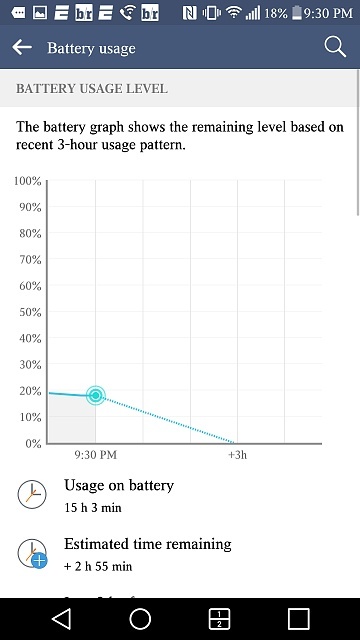 I find the battery life on the v10 to be a little worse than on my Verizon note 4. Not much, but I'm glad I'm getting the extra battery and charger. I find that signal reception in buildings( rural central Ohio) to be worse on t mobile. Nothing to do with v10. Overall I like the v10 though it's taking me a while to get used to buttons on back of the phone. I also like the calendar widget. Saves me from using pure calendar. Second screen is nice but I don't find it that useful. Another tip. You can switch up the home buttons to make then match the note 4. Back button on the right instead of left. The V10 runs circles around the Note 4, so much smoother and more responsive. The Note 4 was a sluggish stutterer from the get go and it was only made worse by TMO's halfbaked Lollipop update. The camera on this V10 is amazing better than what I had with the GS6 or the Note 4. My only gripes are lack of front speakers (HTC and Moto/Nexus spoil us) and lack of Qi out of the box. I'll pay for the Qi backplate just as I did with my Note 4 though. I've been with TMO for 2.5 years and jumped through six androids, I've loved that. Though this fall's lack of carrier sales for Nexus 6P and Moto X Pure is very concerning. Had those two been at TMO, I'm rather sure I wouldn't have given myself a chance with this V10. Thank you to everybody who's shared their input so far! I was particularly afraid battery life would be significantly worse on a V10 than on my Note 4, but it looks like that's probably not the case. If anybody else has insight they'd like to share, I'd still like to hear it! Thanks! I run auto brightness, full GPS, and don't worry about sync. I mostly do work related items, email etc with an occasional bout with Flick Shoot 2. I get about 5-6 hours before needing to hit the charger. Best option for selling my used Note 5?